UK art market; lot 1, 'Sale of Islamic and Indian treasures and jewels', Habsburg, Fedman SA, Geneva, November 8, 1987; by repute, the Maharaja Mahendra of Panna, Nripat Singh (r. 1849-1870). 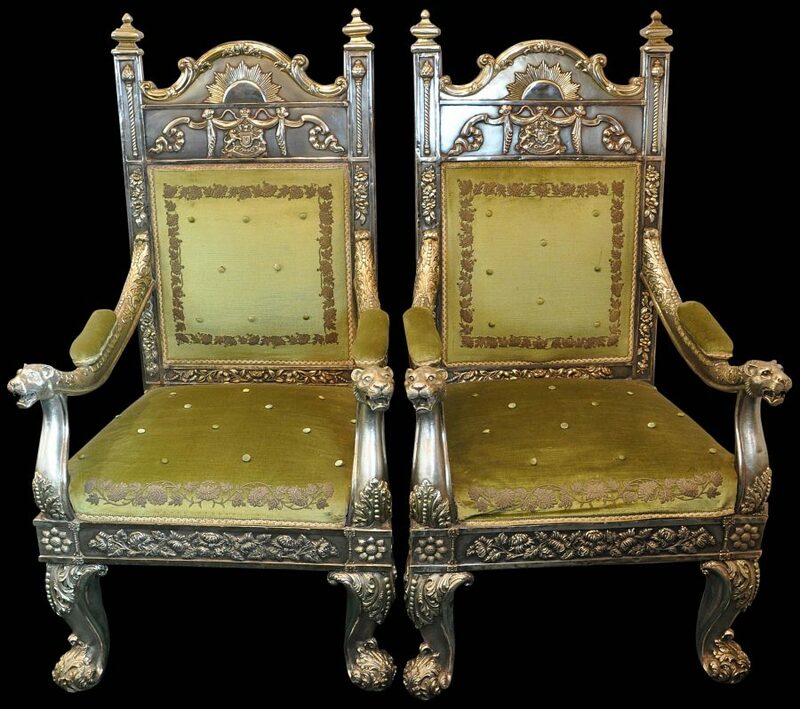 This splendid pair of throne chairs or silver-gilt chairs of state was made for the Maharaja of Panna, who reigned over a northern Indian principality now in the modern Indian state of Madhya Pradesh. The thrones were manufactured in Benares according to the maker’s mark. It is exceptionally rare to find royal, silver- clad throne furniture that can be attributed to both a specific royal household and to an actual Indian maker, making this pair both academically and historically important. 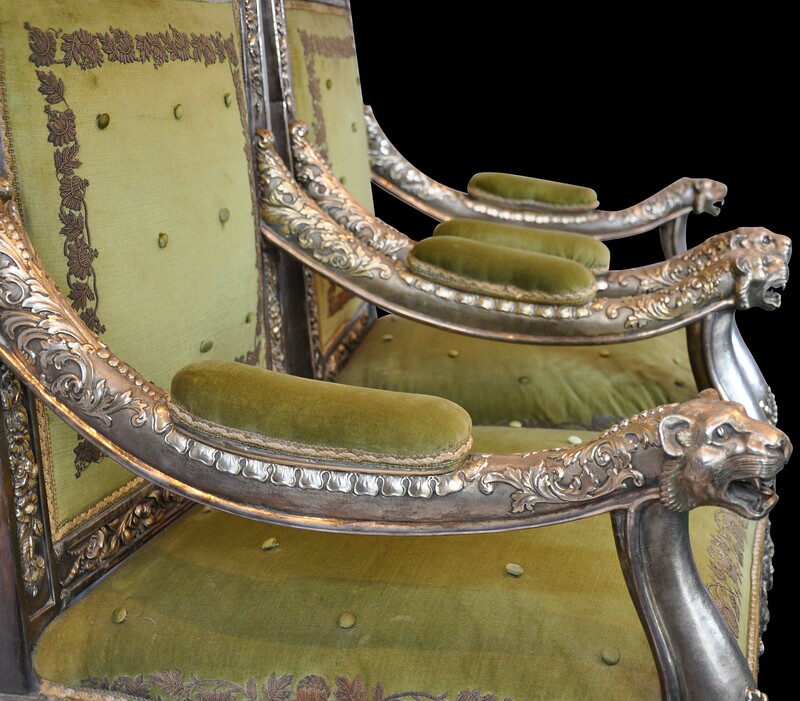 They were offered for sale at an auction of important Indian princely objects in Geneva in 1987. 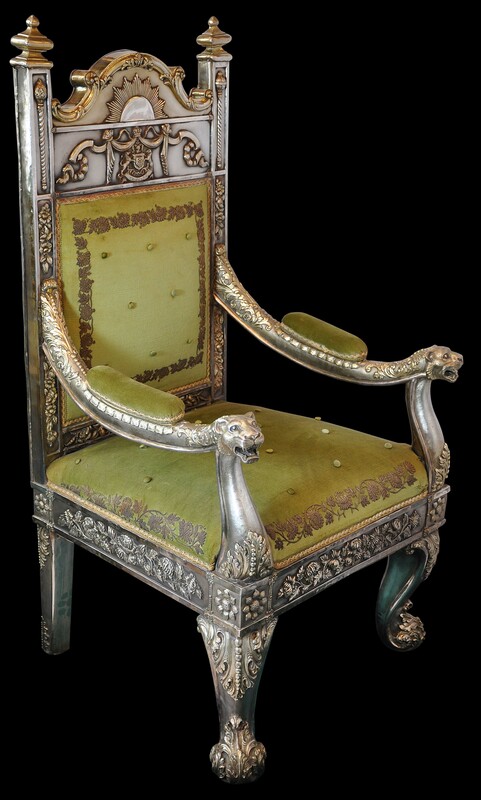 Such throne chairs played an important role in the conception of kingship among the princely states of India during the nineteenth century. 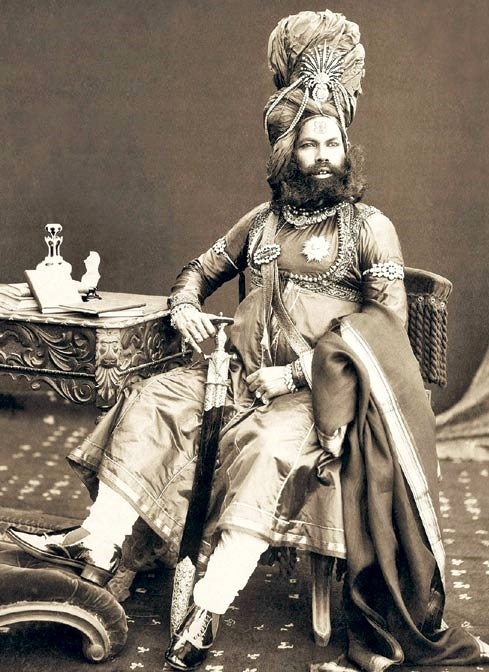 Seated in state on a throne lined with silver (widely assumed to be a pure and purifying metal in India – the sacred Hindu texts all mention silver as an appropriate material for thrones of rulers), and magnificently dressed, the maharajas were the centre of grand public spectacles. The most formal manifestation of this was the durbar, a court affair attended by the maharaja, perhaps his heir (necessitating the use of an additional throne chair), and key members of the government. It was at the durbars that chiefs of local fiefdoms could offer obeisance and tribute, as well as air grievances and present petitions. As Jaffer (2001, p. 224) says, ‘a throne or chair of state is by its very nature meant to eclipse ordinary furniture, not only in its size and the symbolic meaning of its ornament but also in the material of which it is made.’ Jaffer points out that in Europe, thrones tended to be gilded rather than made of gold or silver, but in India, the reverse was true because of the local abundance of precious metals: thrones tended to be wrapped in gold and silver sheet, as is the case here. 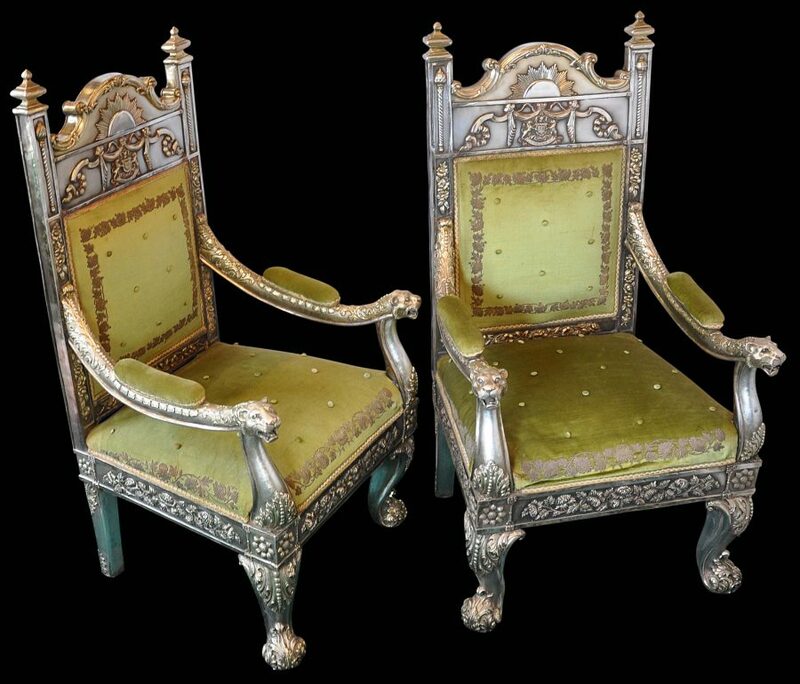 The two throne chairs here are clad entirely in partly gilded (gold-plated) thick silver sheet that has been embossed, repoussed, chased and engraved and laid over the carved wood base. Both retain their original green upholstery which features zardozi embroidery using silver-wrapped thread. 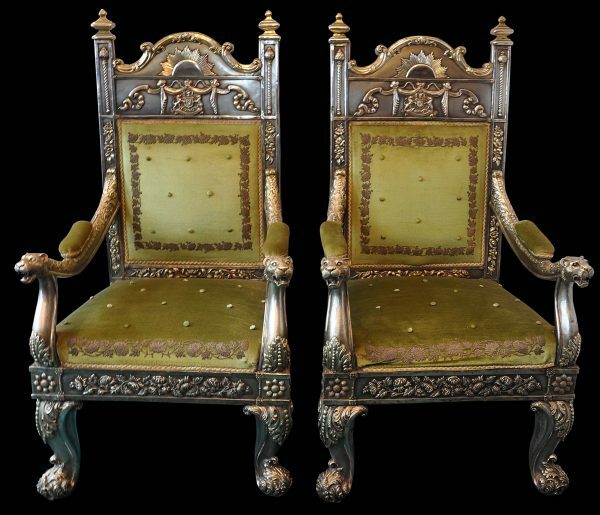 The pair feature European neo-classical style but incorporate Indian themes and motifs, including the Maharaja’s coat of arms, lions, a sun motif and flowers, all in high relief. 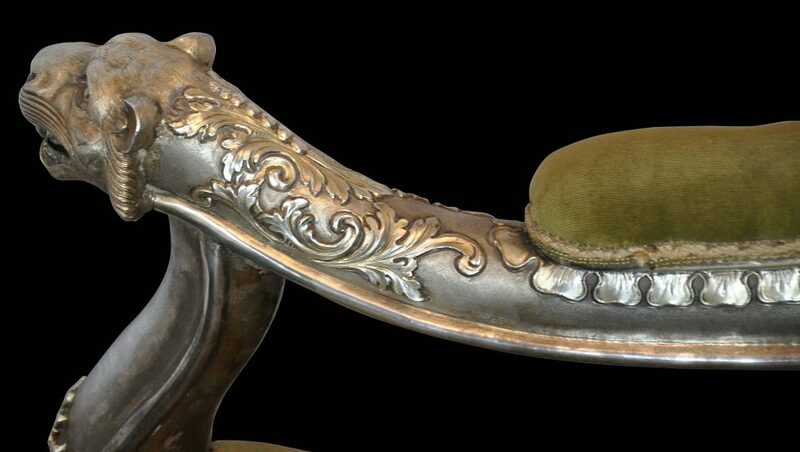 The seat rails and back rails are covered in sheet silver which is further decorated with applied silver floral scrolls. 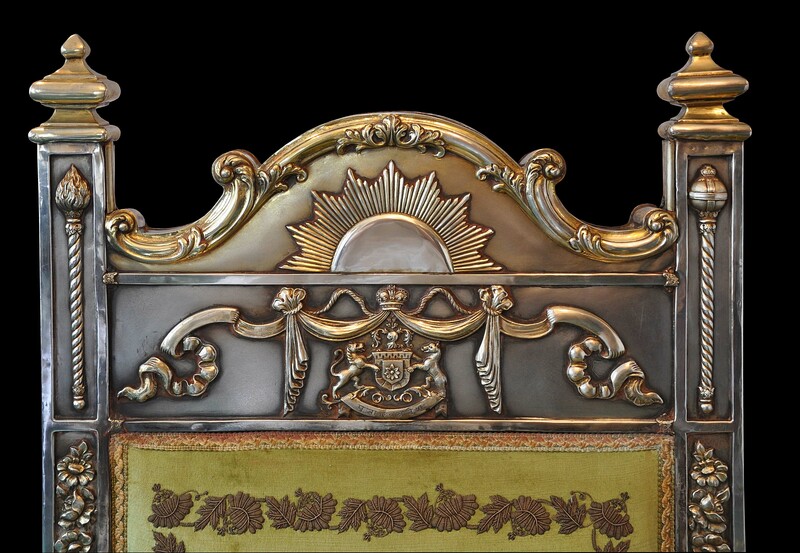 The back rails terminate with gilded, aedicula finials. 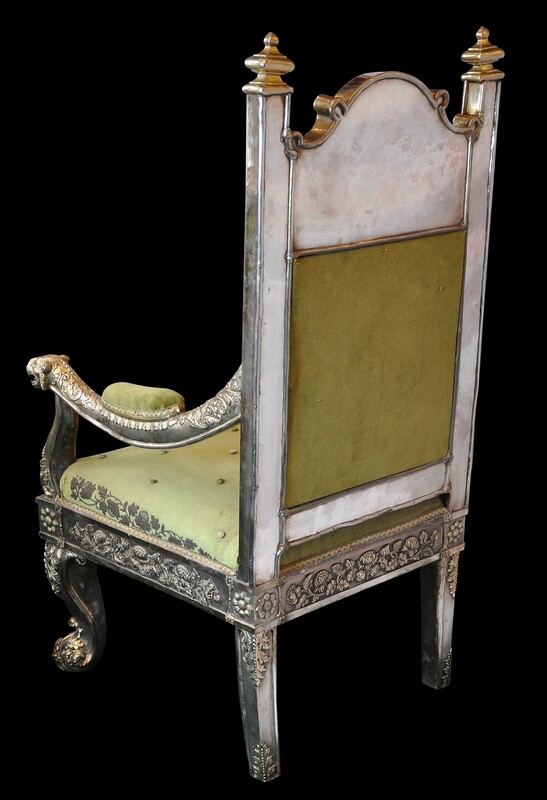 The arm rests are padded and these rise out of silver lotus petal borders. The upper stiles are embellished on one side with an Indian style mace (chob) and on the other with a similar mace but topped by a European-style orb, underscoring the influence of European royal regalia and practice on the Indian courts. The front feet are chased with prominent, scrolling acanthus leaves. Both are decorated with the coat of arms of the royal house of Panna. 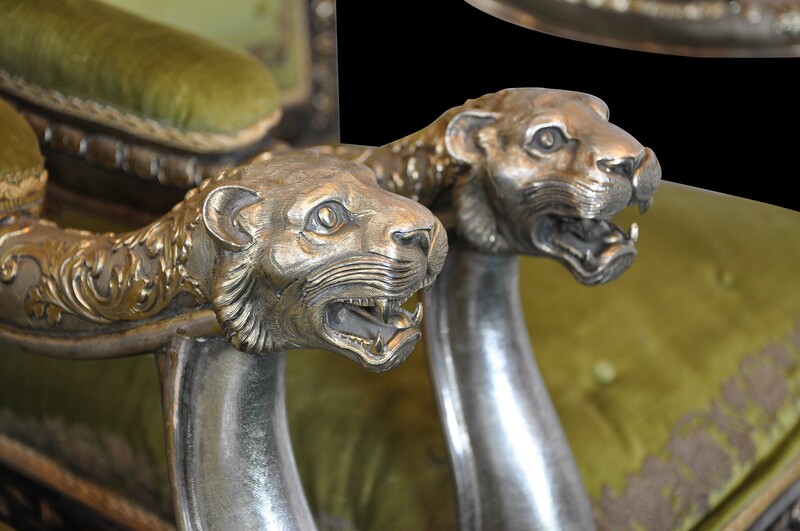 The arm rests terminate in extraordinarily well-rendered lion heads, their mouths open ready to roar revealing sharp teeth and extended tongues. Lions are traditional Indian symbols of kingship. 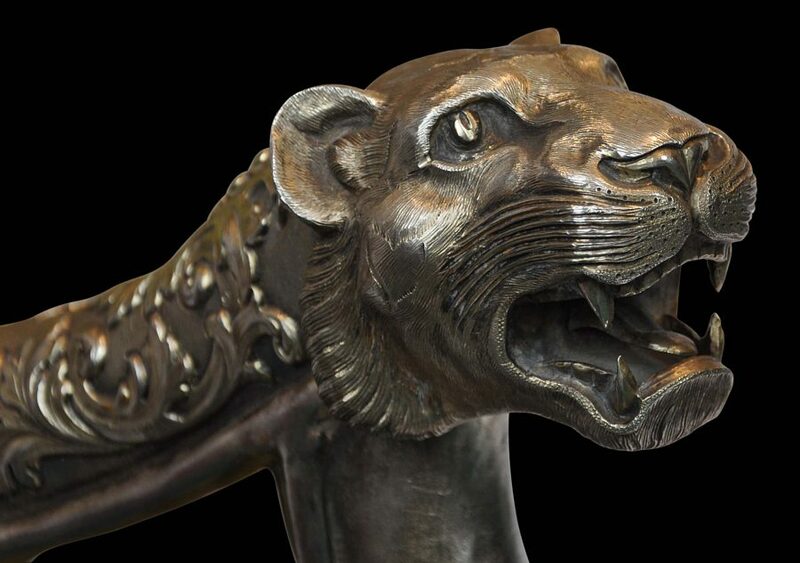 The lion heads have been cast and engraved and most probably largely comprise solid silver. The coat of arms are inspired by European heraldry and feature a shield decorated with a flower motif beneath a border of sable with a lion and bear supports. The crest comprises a helmet surrounded by foliate flourishes and topped by a pipal tree (ficus religiosa). The motto, in devanagari script, reads ‘praja ch’hatra vajreshah’ (‘The Lord of the Thunderbolt/Diamonds is the Protector of the People’). The use of the term ‘vajrashah’ is interesting as it can be taken to mean either ‘lord of the thunderbolt’ or ‘lord of the diamonds’. The double meaning is evocative, as the principality of Panna took in valuable diamond mines. The upholstery is sewn with buttons (all the original buttons are present) and embroidered with silver-wrapped thread in floral borders. 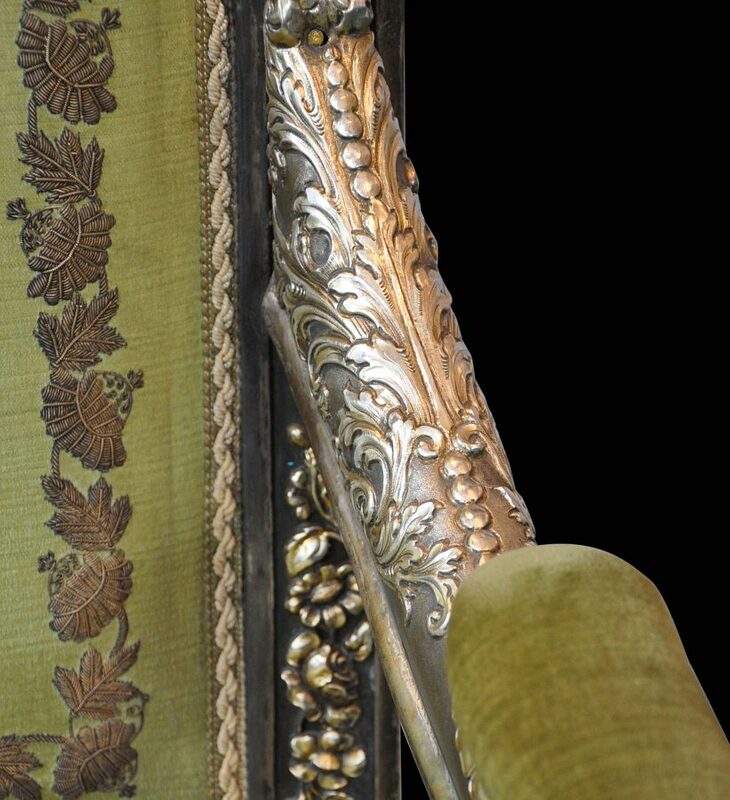 This type of work known in India as zardozi whereby raised silver and gold embroidery was added to velvet and satin, a process that probably was introduced by the Portuguese. Many Indian royal houses commissioned zardozi embroiderers to embellish jackets, shoes, umbrellas, upholstery and even crowns with this work. The zardozi embroiderers typically were Muslim men. 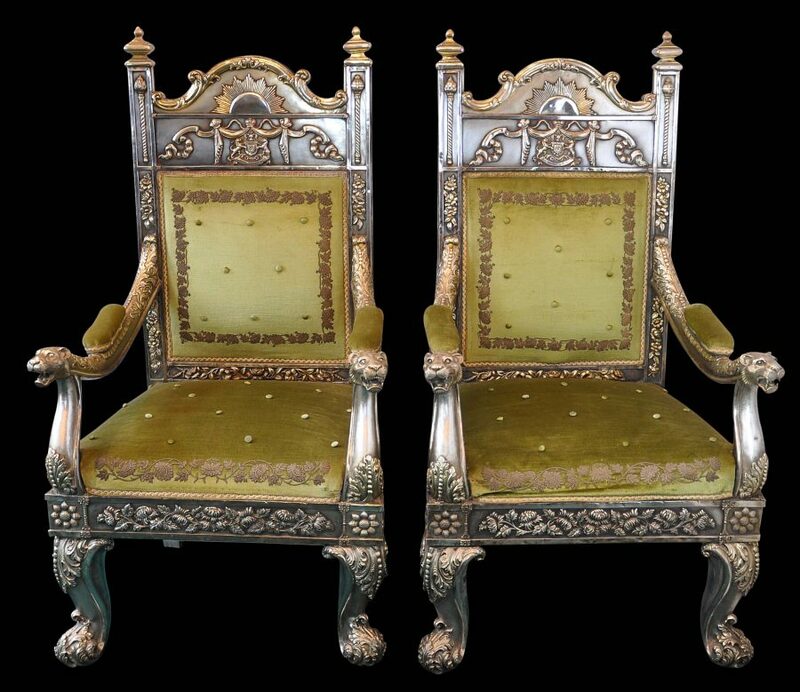 Both thrones are engraved on the reverse with the maker’s name and address. The inscriptions read ‘Made by Benares Gold & Silver Works 27-14 Chowk, Benares City’. The modern version of Panna state was founded in 1731 and emerged out of the typical intra- and inter-family rivalry that was impetus for the founding of most Indian principalities. Maharaja Chhatar Sal, who became a prominent Bundela leader, led a revolt in 1671 against the Mughal Empire and captured Naugaon in present-day Chhatarpur District. In 1680 he conquered Mahoba, and went on to control much of Bundelkhand, ruling from Panna. Upon his death in 1731, his kingdom was divided amongst his sons, and with his ally, the Maratha ruler Peshwa Baji Rao I. That part which contained Panna went to Harde Sah, Chhatar Sal’s eldest son. 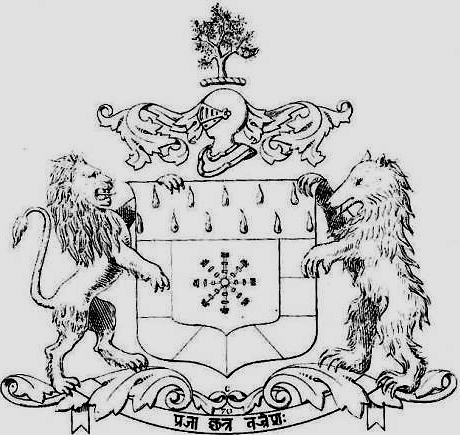 In the early 19th century, Panna became a princely state of British India, and gained control of the states of Sohawal and Nagod. In 1857, Panna’s ruler Nripat Singh, assisted the British when the family of the last Mughal emperor staged a revolt. 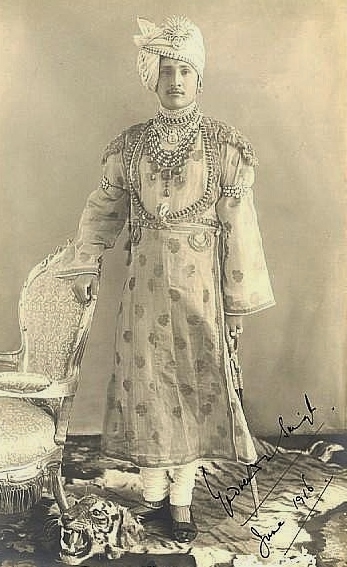 The British rewarded Nripat Singh with the title of Maharaja. The Maharaja’s state was accorded eleven-gun salute status – when the ruler of a princely state arrived at the Indian colonial capital Calcutta and then Delhi, he was greeted with a number of gun-firings, and the Maharaja of Panna was permitted to be greeted with the firing of eleven guns. It also permitted him to be addressed as ‘His Highness’. 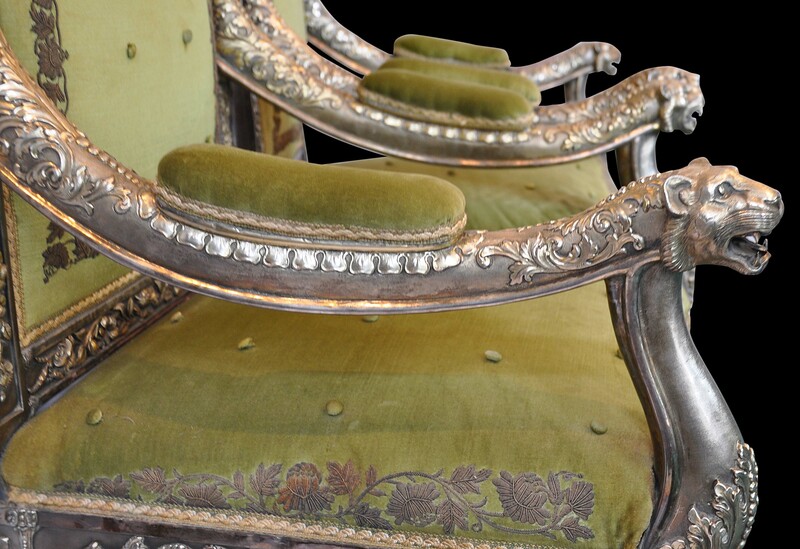 The chairs are in excellent condition. 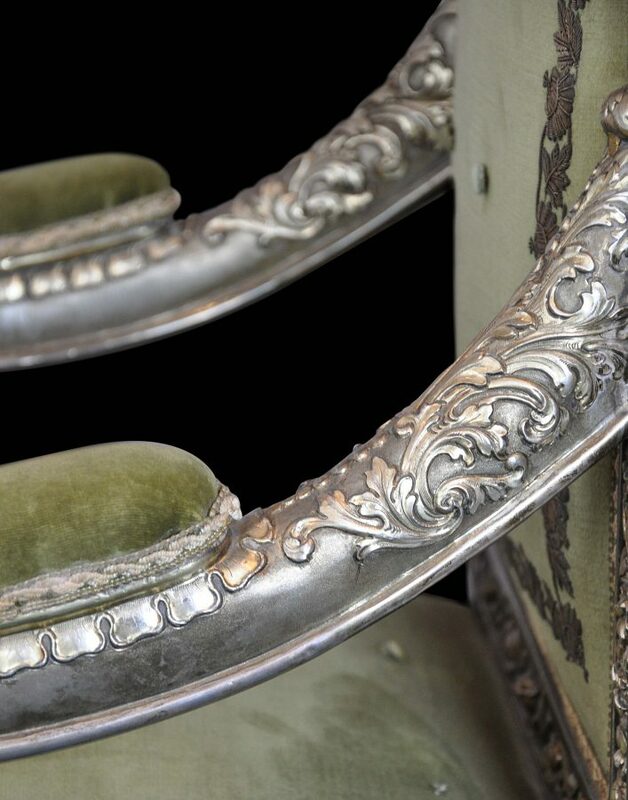 There is some ‘give’ in the seats of one, but importantly and unusually, they retain their original upholstery, the covering of which is in excellent condition. 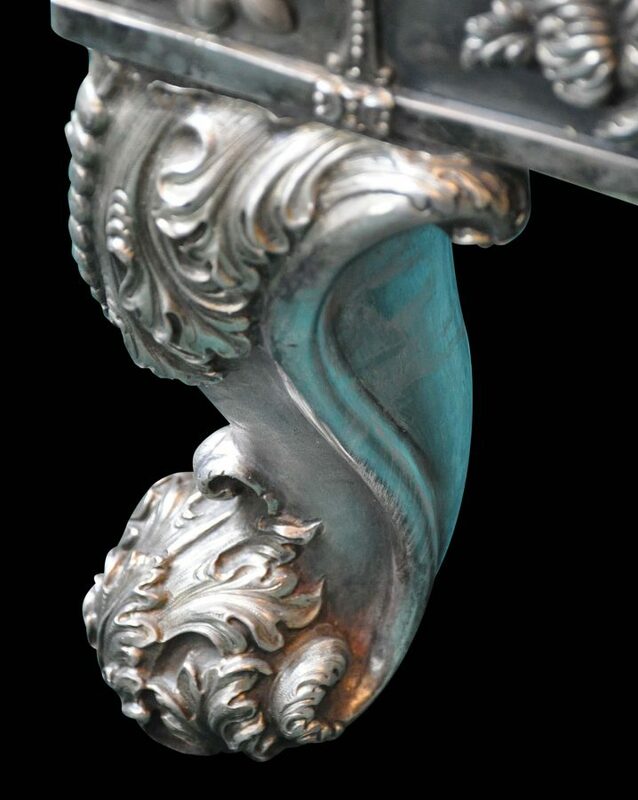 The silver is in fine condition, losses are minimal and any other imperfections are age related and also minimal. Age-related tarnishing is evident; this could be removed or retained according to preference. 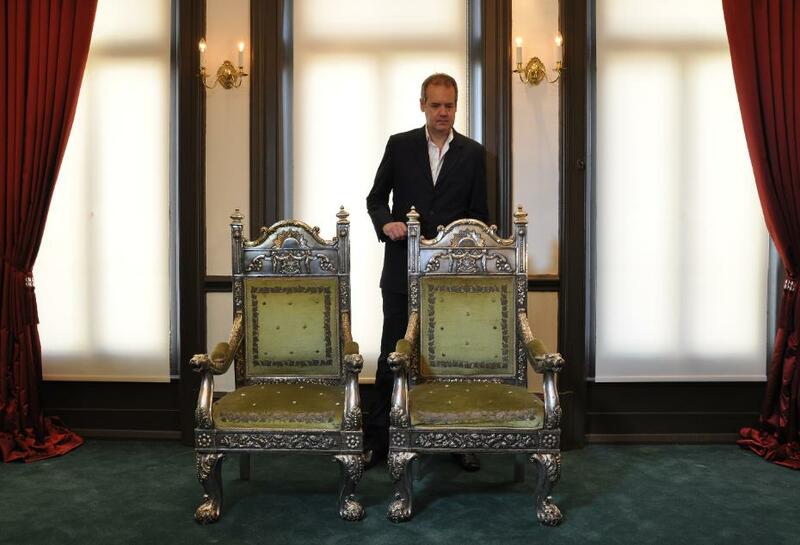 Overall, the throne chairs are rare and important survivors from an evocative and extraordinary age. Allen, C., Maharajas: Resonance from the Past, Mercury Books, 2005. Arts of India: Virginia Museum of Fine Arts, Philip Wilson Publishers, 2001. Jackson, A., & A. Jaffer, Maharaja: The Splendour of India’s Royal Courts, V&A Publishing, 2009. Jaffer, A., Furniture from British India and Ceylon: A Catalogue of the Collections in the Victoria and Albert Museum and the Peabody Essex Museum, Timeless Books, 2001. Shadel Spillman, J., European Glass Furnishings for Eastern Palaces, The Corning Museum of Glass, 2006.